An uxpected early snowfall has come to the Twin Cities. We're no strangers to snow here in Minnesota but come on, October 12th? We had a little dusting of snow on Saturday but this is the real deal. I've measured two and a half inches of snow on the deck so far and it continues to fall. The prediction is that it will all melt quickly and we could be in the 60s by the weekend. We usually don't get snow until after the leaves have fallen from the trees. The red maple outside the front door of the nature center was gorgeous this morning covered in fresh white snow. I love the snow and I hope we get a lot of deep snow that sticks around all winter but Ill be perfectly happy of we don't see any real snow until the end of November. I'm not mentally or physically ready for this yet. 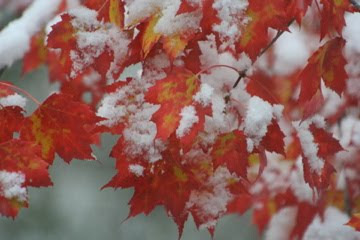 Snow on autumn leaves is a beautiful sight - but not one I hope to routinely enjoy!